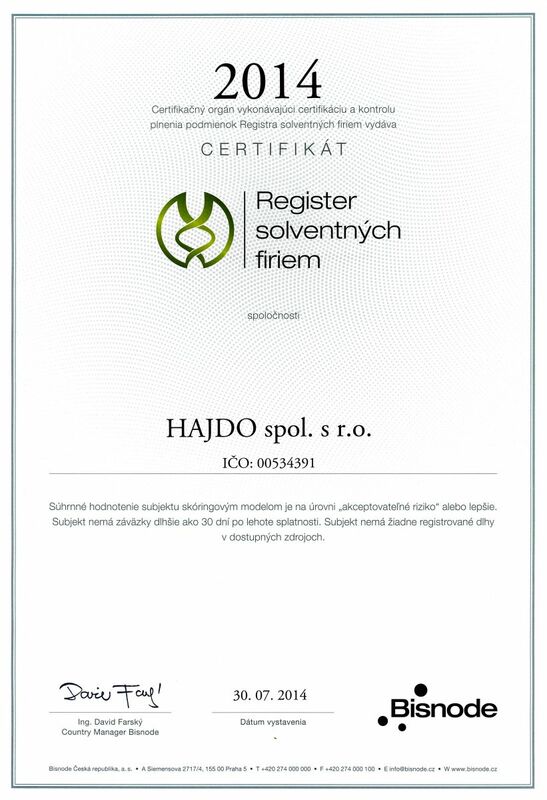 COMPANY - HAJDO spol. sr.o. HAJDO s.r.o. (Limited Liability Company) was founded in 1990. While initially the main focus was on the paper industry, today the company operates in the area of general machine engineering. HAJDO s.r.o. is also involved in related industries such as stationary hydraulics, industrial pneumatics, lubrication and spray systems, repairs and production of universal joint drive shafts. HAJDO s.r.o. owns the construction and design office and has necessary assets for manufacturing, assembly, and service activities. It makes it the perfect partner for realization of various client's requirements. It allows new complex machine lines to be manufactured and supplied and the existing machinery to be rebuilt, upgraded, and modernized. 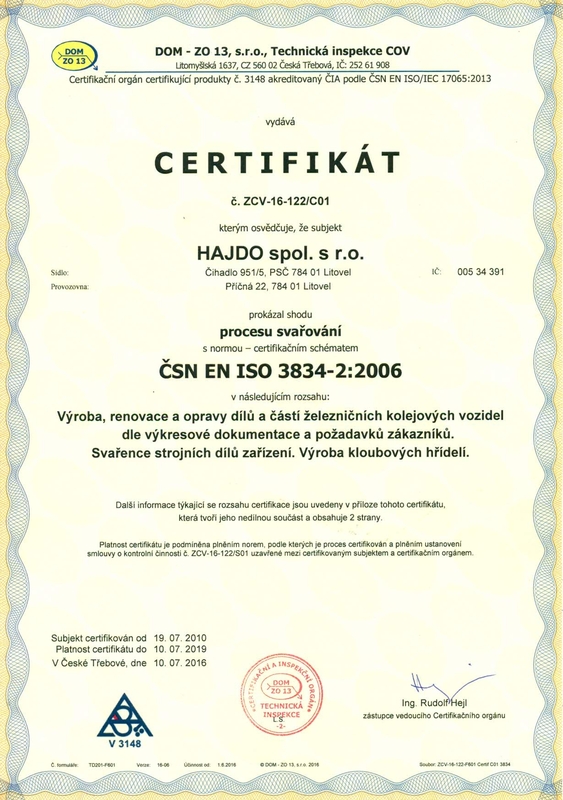 In 1997 HAJDO s.r.o. started a wholesale business selling threaded pipe couplings and related products manufactured by Walterscheid (now Eaton), and threaded pipe couplings and components for industrial pneumatic systems. ISO 9001:2000 Quality Management System. – The certificate is valid from March 2004 for the field of engineering production. 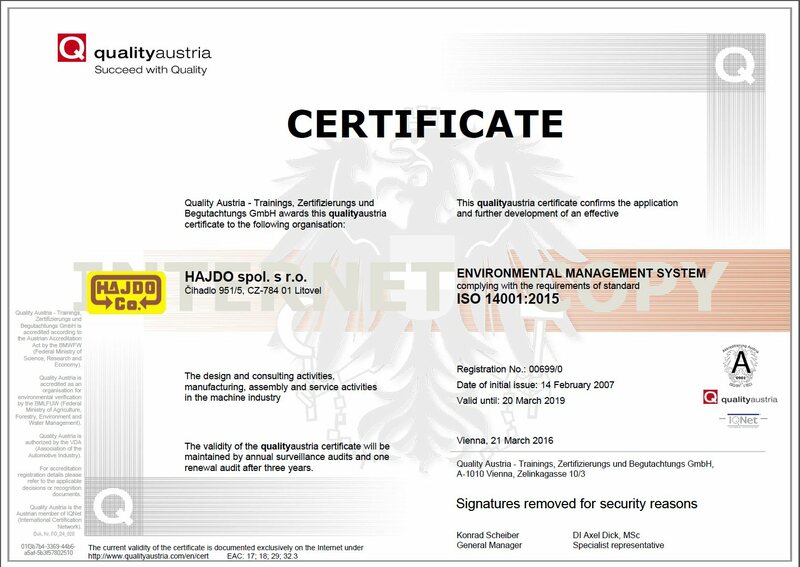 – The certification body was ÖQS. – The certificate is valid from February 2007. 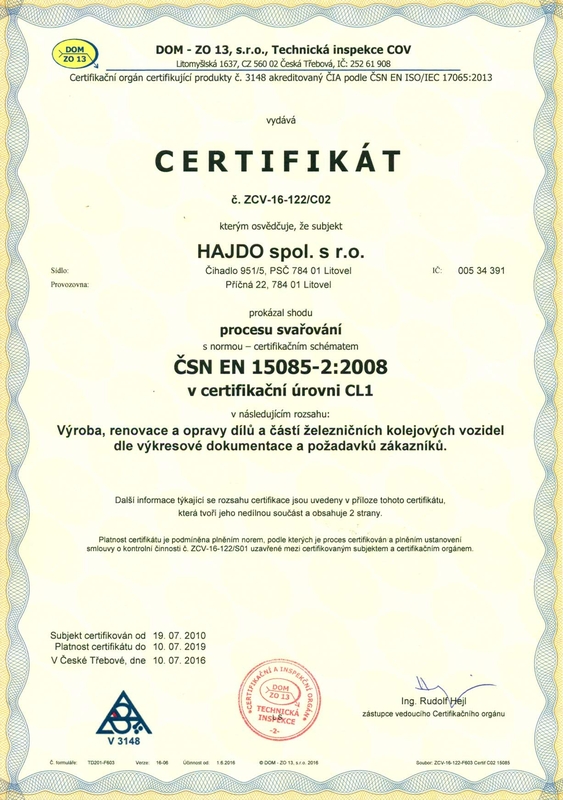 Certificate for welding rolling stock and components in Class CL1 according to ČSN DIN 15085-2. – The certificate is valid from July 2010. – The certification body was DOM-ZO13. 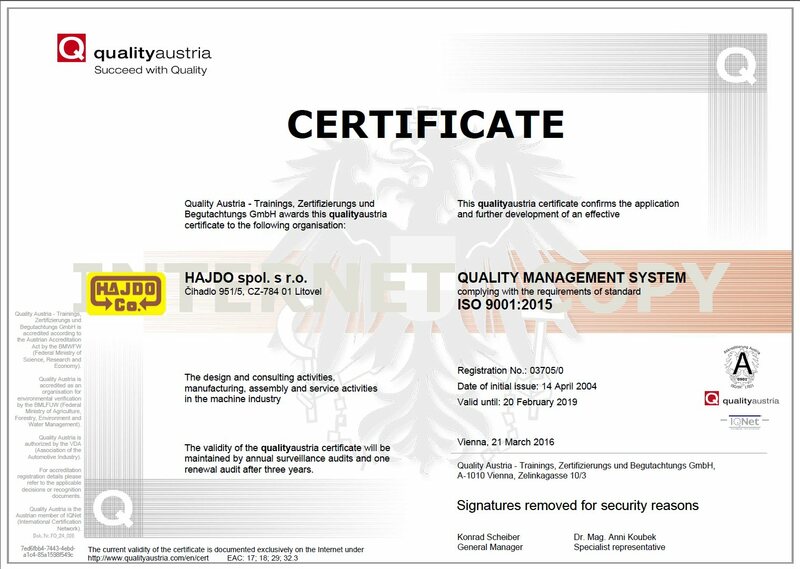 Certificate according to ČSN EN ISO 3834-2 ”Quality requirements for fusion welding of metallic materials, Part 2: Comprehensive quality requirements”. HAJDO s.r.o. 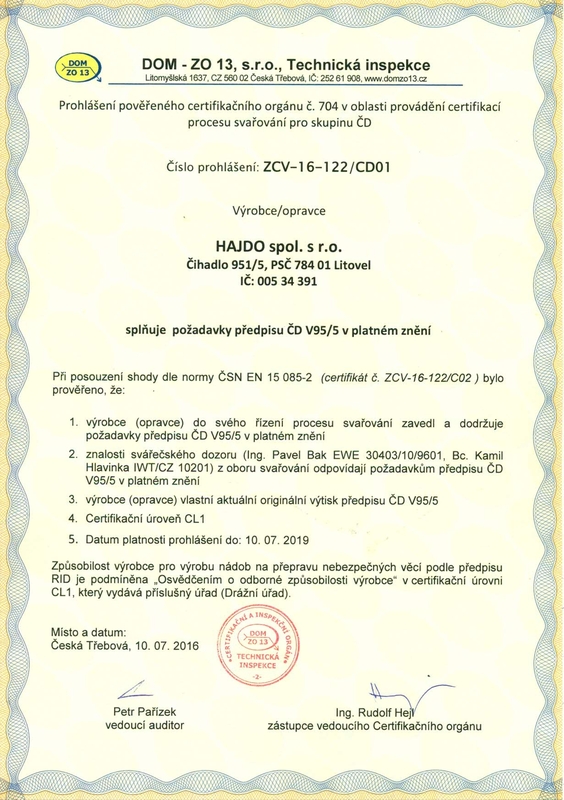 meets the requirements of ČD V95/5 regulation.